November 27, 2012: The British-Pakistan Foundation held a Roadshow on November 16th, 2012, to raise awareness within the UK Pakistani Diaspora about the ‘third sector’ activity in Pakistan in terms of civil society contribution towards the development agenda in Pakistan and to present successful health sector examples to the diasporas. Asif Rangoonwala, Chairman BPF made the opening remarks for the panel, which was moderated by Suniya Qureshi, BPF Executive Director. The panel included Mr. Shoaib Sultan Khan, Representative RSPN; Saquib Hameed, Executive Director LRBT; Moazzam Malik, Director West Asia DFID; Dr. Mohammed Iqbal, Representative APPSUK, Dr. Zafar Iqbal, Representative Medic Liverpool FC and our president Sania Nishtar, who showcased the work of Heartfile. November 14, 2012: The Summit on the Global Agenda is an annual global brainstorming that brings together members of the World Economic Forum’s Network of Global Agenda Councils. In its fifth session this year, over 700 expert members of the Network of Global Agenda gathered at the Summit to address over 70 areas of global interest. The webcast of the Summit can be accessed here and the executive summary can be viewed here. Our President, Sania Nishtar attended the meeting as a member of the Council on Wellbeing and Mental Health. November 14, 2012: The paper titled “How to achieve international action on falsified and substandard medicines” published today (November 14th, 2012) in the British Medical Journal calls for a treaty on falsified medicine. Amir Attaran, Associate Professor in the Faculties of Law and Medicine at the University of Ottawa was the lead author of this paper. One of the key attributes of this paper was the scale of international consensus it garnered amongst international development, public health and legal experts. Our President, Dr. Sania Nishtar was one of the co-authors. 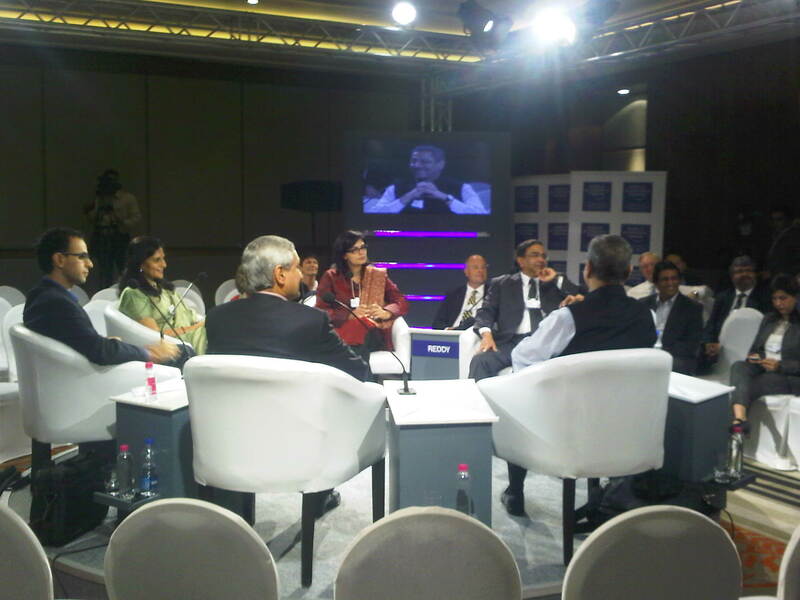 November 12, 2012: The World Economic Forum on India 2012 was held from November 7-8, 2012 in New Delhi where leaders were invited to share their ideas on India’s development. One of the sessions “Health Collaboration as a Bridge”, looked at nurturing cross-border relationship through health and building partnerships. Panelists from the Indian side included Dr. Naresh Trehan, Chairman, Global Health Private, India; Prof. K Srinath Reddy, President, Public Health Foundation of India (PHFI), India and Pretha C. Reddy, Executive Chairman, Apollo Hospital Enterprise. Our president, Sania Nishtar, and Jahangir Khan Tareen, Former Minister of Special Initiatives, Government of Pakistan were the panelists from the Pakistan side. The synopsis can be accessed here. November 11, 2012: Heartfile and International Development Research Centre (IDRC) jointly hosted a Satellite event on the occasion of the 2nd Global Symposium on Health Systems Research in Beijing on November 3, 2012 at the Beijing International Conference Centre. The event was organized as a consultation, with the purpose of soliciting peer views on Heartfile Health Financing’s evaluation strategy. Panelists included Sharmila Mhatre (IDRC), Dr Abdul Ghaffar (WHO), Dr. Johanthan Quick (MSH), Dr. Babak Pourbohloul in addition to Dr Faraz Khalid and Dr. Sania Nishtar, from Heartfile. 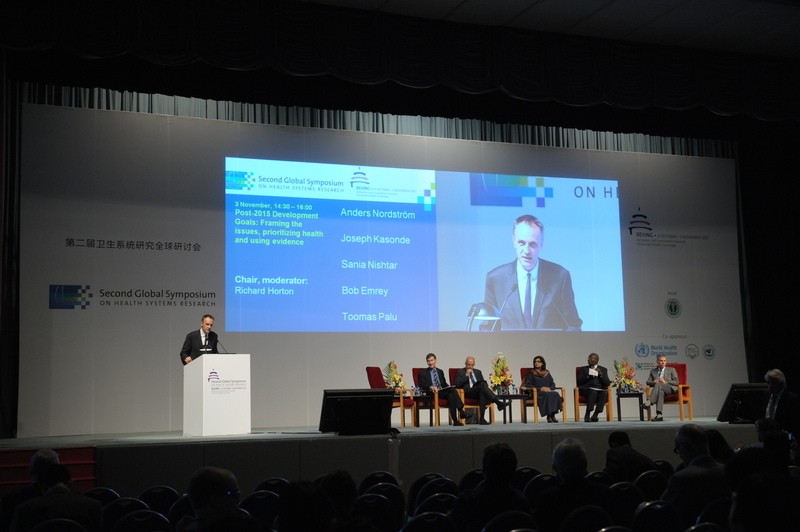 November 11, 2012: The Second Global Symposium on Health Systems Research was held from October 31st till November 3rd, 2012 in Beijing which was attended by over 1,700 representatives from more than 100 countries and 760 institutions. The final Plenary on Post-2015 development goals: Framing the issues, prioritizing health and using the evidence was chaired by Richard Horton, Editor-in-Chief, The Lancet and the plenary speakers included Joseph Kasonde, Minister of Health of Zambia; Anders Nordström, Ambassador for Global Health, Ministry for Foreign Affairs, Sweden; Bob Emery from USAID; Toomas Palu, from the World Bank and our president, Sania Nishtar. The Webcast for which can be accessed here. November 06, 2012: A pre-conference for Emerging Health Systems Research for Universal Health Coverage was held in School of Public Health, Peiking University, Beijing on 29-30 October 2012. Dr. Faraz Khalid from Heartfile was one of the young voices who presented findings of his literature review on “Health Equity Fund: Experiences in lesser developed countries” in the Health Systems Financing Research session. The concept of development, through which governments view social policy in environments where capitalism is the mode of social organisation, may be up for a major rethink, globally. This year, policy signals at agenda-setting global convening and major publications seem to be heralding new directions. But in each of these, the onus of responsibility is seen to be swinging more squarely towards domestic policy. Three points are being outlined to draw attention to the potential levers of change and possible insights for Pakistan. First, there is a palpable emphasis on “investment” rather than “aid” as a strategy for development, and recognition, that development happens through “jobs”, rather than through “growth” alone. In fact, the World Development Report, 2013, has featured jobs, boldly in its monosyllable title and has opened with the statement “development happens through jobs”. Indeed, evidence confirms that one of the strongest determinants of achieving many development outcomes is per-capita income. Ideally, governments should aim to create the conditions that catalyse investments – macroeconomic stability, rule of law, enabling legislation, facilitative regulation, and a level playing field so that businesses can be supported, thus creating jobs. But doing just that doesn’t suffice. They must also address impediments posed by market imperfections, so that jobs with the greatest development pay-offs can be created. Barring exceptions, it is increasingly recognised that most G77 countries should utilise aid for improvements in productive assets and institutional strengthening, so that over time they are able to reduce reliance on development assistance. This vision of development places a huge onus of responsibility on governments, rather than development agencies, which is how exactly it should be. Secondly, with the global financial and sovereign debt crises as a context, there appears to be an emphasis on accountability not just for results but also for decisions. The importance of oversight at the fiduciary and regulatory levels has become salient and the imperative to optimise the use of resources, minimise leakages from the system, and institutionalise fiscal responsibility and debt limitation has never been more compelling. There are some straightforward, but hard to deliver policy tasks, of governments in this space. Third, as planning gets underway to develop a post-2015 development agenda – the year in which millennium development goals will (MDG) come to term, there may be additional tasks of governments, as part of the world’s new promise, the sustainable development goals. While a sustained focus on poverty and the inclusion of environment, post Rio+20, is inevitable, other aspects of sustainable development are also likely to be included. Delivery on this new wave of global promises is not a matter of vertical thinking and silo planning. Most reviews since the MDGs have consistently raised the importance of strong institutional systems as a prerequisite for delivering on vertical targets. Partnerships are now regarded as a sine qua non of development for a whole host of reasons, amongst which harnessing of today’s burgeoning of technological and scientific innovations in a globally interconnected world, is the foremost. For example, cell phones on their own are termed as one of the most effective channels for reaching out to those at the bottom of the pyramid and provide services that help people lift out of poverty by enabling unprecedented communication, information dissemination, tracking and financial services delivery. A powerful combination of factors is driving change in this regard in the developing world of which advances in technologies and applications and growth in coverage of mobile cellular networks is the most salient – and this is just one example. It is therefore up to astute governments to act inter-sectorally within the state system, as well as engage the right actors both within and outside of the development space in the private sector to forge the conditions that can tackle unemployment, step up long term inclusive growth, accrue the benefits of growth equally to populations, and take quantum leaps in development and poverty eradication. This paradigm shift necessitates a whole new set of competencies for governments in terms of stakeholder engagement, and oversight and regulation. Results can only be as governments will make them. Short-sighted and graft-ridden governments cannot remedy their own deficiencies by seeking to yoke the private sector to their own uncertain cart. Does Pakistan have the necessary conditions for investment and the ability to create jobs with the greatest development pay-offs? Does it have the capacity to reduce dependence on aid and address the central systemic barriers, which impede delivery on vertical targets, of which polio is currently the hallmark? Does the state system have the ability to act inter-sectorally to harness the potential within partnerships and help take to scale innovations that are burgeoning outside the state system? I leave it to the readers to reflect on these questions? November 05, 2012: Our president, Dr. Sania Nishtar recently published her views on Development and how Pakistan fits into the post-2015, Millennium Development Goals agenda. Her article has been published in the Huffington Post on October 31st, 2012 and in The News on November 5, 2012.